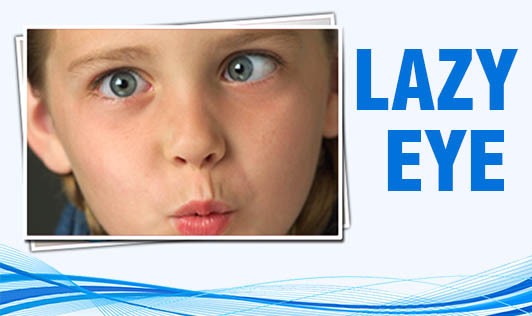 Lazy eye, also called Amblyopia, is decreased vision that results from abnormal visual development in infancy or early childhood. Although this usually affects only one eye, it can also affect both the eyes. This is the leading cause for decreased vision among children. If left untreated, vision loss may range from mild to severe. Strabismic - This is the most common cause of lazy eye. It is an imbalance in the muscles that are responsible for positioning of the eyes. This can then cause the eyes to cross in or turn out because the muscle imbalance prevents the eyes from tracking together in a coordinated way, and hence, finding it hard to focus. Deprivation - Deprivation lazy eye occurs if there is a problem with one eye, such as a cloudy area in the lens (cataract). This "deprives" the child of clear vision in the eye. Refractive - This type of lazy eye is a result of a significant difference between the vision in each eye, due to nearsightedness, farsightedness or an impaction in the surface of the eye. There are vision problems that are typically corrected by glasses or contact lenses. If you notice that your child's eye is wandering at anytime beyond the first few weeks of life, consult a doctor. Depending on the situation, your doctor may refer your child to an ophthalmologist. Thereafter, the length of the treatment will depend on several factors including your child's age, the severity of the problem and adherence to the treatment.